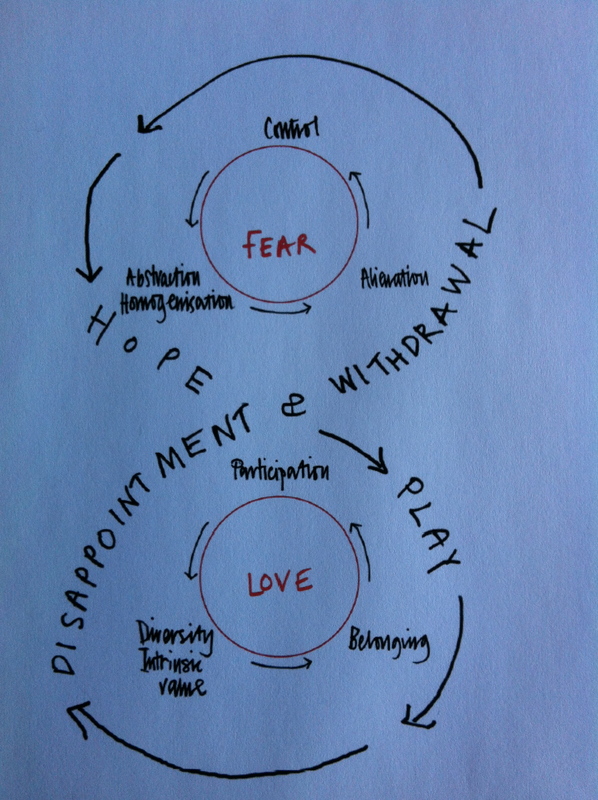 In Love and Fear (Part One) I focused on some of the personal insights coming out of the Centre for Narrative Leadership gathering on this theme in early July. In particular, the universal qualities of love were contrasted with the particular fears that uniquely get in the way of each one of us as we seek to express those qualities. In Part Two, I want to look beyond personal insights to consider the wider consequences of adopting love and fear as existential stances: what does it mean for us to live in the world from a position of love and/or a position of fear? The late Professor Brian Goodwin considered exactly this question at a meeting of the International Futures Forum in November 2001. He summarised the difference in terms of holistic science (primarily concerned with qualities) and enlightenment science (primarily concerned with quantities). The latter – driven by fear – reflects an alienation from the natural world and a consequent desire to control it. The former – driven by love and trust – reflects an intrinsic valuing of the natural world and a consequent desire to participate in it. Thomas Berry puts this eloquently and memorably as “thinking of the world as a communion of subjects instead of a collection of objects.” Thus, as I put it in Coming Home to Story, to be human is to participate in the whole of existence: we are merely a part of and not the pinnacle of Creation. We do not have the right to assume dominion over nature but – driven by fear and a desire for control – we have done so for centuries and at great cost! It would be naive (and potentially dangerous) to believe that we can banish fear absolutely in favour of love. There are circumstances when fear is the most appropriate response: we should be afraid of the charging lion, the armed criminal, the impact of climate change. The trouble comes when we transmute particular and contextual fears into an unthinking existential stance that unconsciously shapes our actions and our world view. Let me give an example of approaching the natural world from an existential position of love and trust. In 2010, my partner Chris Seeley and I spent 4 days with Dr Lynn Rogers at the Minnesota Wildlife Research Centre deep in the forest. Dr Rogers has studied North American Black Bears at close quarters for over 40 years. His method is to establish a relationship of trust with wild black bears by giving food (wild bears like an easy meal) and appropriate body language (e.g. not to make direct eye contact). In this way he has been able to place radio collars on selected bears without tranquilizing them and thus to track and observe them closely in their natural habitat. His work has been the subject of several BBC Wildlife documentaries. Are black bears dangerous? They are certainly stronger than we are and capable of inflicting fatal wounds. But, contrary to scare-mongering myths, black bears are not aggressive if approached in the right manner. Under some circumstances we would be right to fear them but that does not mean that we need to demonise and shoot them indiscriminately. Fear or love? It is estimated that on average the 750,000 black bears in the United States kill fewer than 1 person a year. An American citizen is actually 16,000 times more likely to be a murder victim than killed by a bear. All this in light of the fact that US hunters legally shoot more than 30,000 black bears each year. It is time (and there may only just be time) to shift our centre of gravity from fear of the natural world to love. If we do not, the prospects for our planet and all its inhabitants are poor indeed.